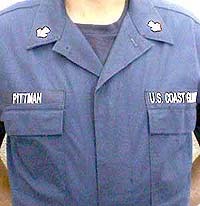 The District Commander or the TRACEN Commanding Officer may prescribe alternatives as necessary for specific work assignments or inclement weather. All uniform items shall be worn in accordance with applicable directives. 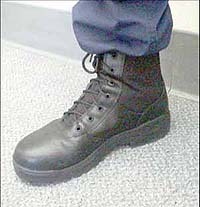 Boots may be all leather or a combination of synthetic and leather as shown (3.C.9). Socks can be knee length or mid calf but any portion above the boot must be black in color. With trousers properly fitted and bloused, socks will not be visible. Attach the “band” around the top of the boot. Pull the trouser cuff over the band and roll the cuff inward, underneath the band. 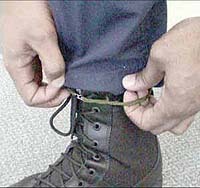 Once the cuff is in place, position the band just above the second eyelet of the boot. Blousing bands and socks should not be visible. Cord style (shown) and VelcroÔ bands are authorized (dark colors). The ODU belt & buckle are to be worn by both men and women in the same manner as the men’s standard CG belt. The metal tip is run through the belt loops beginning on the left side of the zipper. 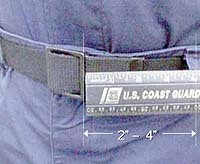 Once fastened, the metal tip will extend from 2” to 4” beyond the buckle. 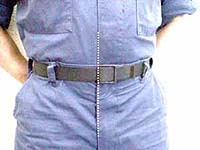 The right side of the buckle (as viewed by wearer) shall be aligned with the right side of the shirt opening and the right side of the zipper to form a straight line as shown (both men and women). buckle, and trousers (gig line). 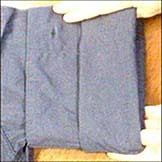 Cloth tapes are centered over the pockets as shown with the width of the tape running the width of the pocket flap. 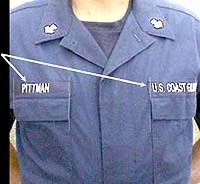 The member’s last name goes over the right pocket and U.S. COAST GUARD over the left. VelcroÔ tapes are optional. 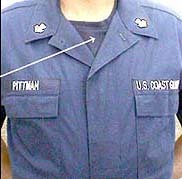 Direct embroidery and plastic name tags are prohibited (3.F.2). Cloth tapes will consist of background color matching ODU material with white block letters between ½” to ¾” high. Only member’s last name is permitted. Tapes will be of the same size and shall be sewn on with matching blue thread at six (6) stitches per inch (3.F.2). 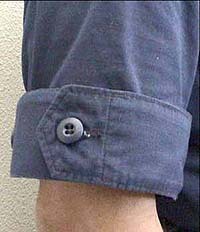 Sleeves may be worn down with cuffs buttoned (or) with sleeves neatly rolled. When properly rolled, the cuff should be approximately 2” above the elbow (mid-bicep) with only the cuff visible (3.C.3). To properly roll the sleeves takes some patience and a little practice, but once mastered can be achieved without difficulty. 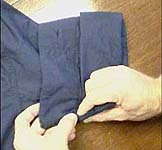 Depending on an individual’s size and sleeve length some sleeves may be rolled with one fold while others will take two. 1. Fully extend and flatten the sleeve on a level surface. 2. Starting at the cuff turn sleeve inside out to armpit as shown. Take care to flatten the sleeve to remove any irregular folds or creases. 3.3. To form the fold, roll the sleeve in half again to form two equal segments the width of the “cuff”. (Pinching the outer edge of the sleeve to begin the fold will help to keep the fabric from slipping). 5.Once in place, take care to flatten the sleeve to remove any irregular folds or creases. When properly done, only the cuff should be visible. 6.To remove the roll, simply pull the lower edge of the cuff downward toward the wrist. Metal collar devices are standard while sew-on cloth devices are optional. Both are to be centered on the collar along an imaginary line bisecting the angle of the collar point (3.D.1.d; 3.D.2.a).